The Nivkh (also Nivkhs, Nivkhi, or Gilyak; ethnonym: Нивхгу Nʼivxgu (Amur) or Ниғвңгун Nʼiɣvŋgun (E. Sakhalin) 'the people') are an indigenous ethnic group inhabiting the northern half of Sakhalin Island and the lower Amur River and coast on the adjacent Russian mainland. Nivkh were traditionally fishermen, hunters, and dog breeders. They were semi-nomadic, living near the coasts in the summer and wintering inland along streams and rivers to catch salmon. The land the Nivkh inhabit is characterized as taiga forest with cold snow-laden winters and mild summers with sparse tree cover. The Nivkh are believed to be the original inhabitants of the region, and to derive from a proposed Neolithic people that migrated from the Transbaikal region during the Late Pleistocene. The Nivkh suffered heavily from foreign influences, the first of which was the migration of the Tungusic peoples. [citation needed] Later, Qing China forced the Nivkh to pay tribute to them. In the 1850s–1860s, Cossacks of the Russian Empire annexed and colonized Nivkh lands, where they are a small, often neglected, minority today. Today, the Nivkh live in Russian-style housing and with the over-fishing and pollution of the streams and seas, they have adopted many foods from Russian cuisine. The Nivkh practice shamanism, which is important for the winter Bear Festival, though some have converted to Russian Orthodoxy. As of the 2002 Russian Federation census, 5,287 Nivkh exist. Most speak Russian today, and about 10 per cent speak their native Nivkh language. Nivkh is considered a language isolate, although it is grouped, for convenience, with the Paleosiberian languages. The Nivkh language is divided into four dialects. Nivkh (plural Nivkhgu), an endonym, means "person" in the Nivkh language. They may also be referred to as Nivkhi in 1920s Western literature, due to the romanization of the Russian term "нивхи", which is the plural of "нивх" (nivkh). In the seventeenth and eighteenth centuries, Russian explorers first termed the group Gilyak (also Giliaks or Giliatski). The etymology of the name "Gilyak" is disputed by linguists, with some believing the name originated from an exonym given to the Nivkhs by a nearby Tungusic group. Other scholars believe that "Gilyak" derives from Kile, another nearby Tungusic group that the Russians had mistakenly named Nivkhs. "Gilyak" is the Russian rendering of terms derived from the Tungusic "Gileke" and Manchu-Chinese "Gilemi" (Gilimi, Gilyami) for culturally similar peoples of the Amur River region, and was applied principally to the Nivkh in Western literature. The origins of the Nivkh are hard to discern from current archaeological research. Their subsistence by fishing and coastal sea-mammal hunting is very similar to the Koryak and Itelmen on the Kamchatka Peninsula. 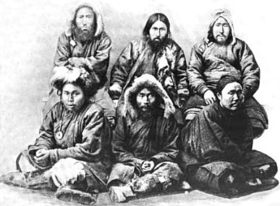 The rigging of dog-sledges is also similar to these Chukotko-Kamchatkan groups. Spiritual beliefs are similar to those of the Northwest Coast Indians of North America, whose ancestors migrated from this area. The Nivkh are physically and genetically different from the surrounding peoples, and scholars believe they are the indigenous inhabitants of the area. The current archaeological model suggests that a sub-Arctic technological culture originating from the Transbaikal region, termed the microlithic culture, migrated across Siberia and populated the Amur and Sakhalin region during the Late Pleistocene, perhaps earlier. Scientists believe that people of this microlithic (small tool) culture were the first to migrate eastward into the Americas. The microlithic culture was technologically adept in the harsh climate of Siberia during the last ice age. After the ice receded, Tungusic peoples from the south pressed into the warmer northern areas, soon dominating the settled peoples. The Nivkh are considered the last surviving ethnic group able to adapt to the warmer climate and not be assimilated or squeezed out by the newcomers, hence the Nivkh isolate language. The earliest archeological radiocarbon dating for Northern Sakhalin as of 2004 is the Neolithic Age- Imchin Site 2, dated at 4950–4570 BCE near the Tym' River Estuary on the west coast. Lell et al. (2002) tested a sample of seventeen Nivkh males and found that six of them (35%) belonged to Haplogroup C-M48, six of them (35%) belonged to Haplogroup P-M45(xQ-M3, R-M17), two of them (12%) belonged to Haplogroup C-M130(xM48), two of them (12%) belonged to Haplogroup K-M9(xO1a-M119, O2-M122, N-Tat, P-M45), and one of them (6%) belonged to Haplogroup O1a-M119. Tajima et al. (2004) tested a sample of twenty-one Nivkh males and found that eight of them (38%) belonged to Haplogroup C-M217, a haplogroup which is also common among Koryaks, Itelmens, Yukaghirs, Tungusic peoples, and Mongols, six of them (29%) belonged to Haplogroup K-M9(xO2-M122, O1a-M119, P-P27), four of them (19%) belonged to Haplogroup P-P27(xR1a1-SRY10831.2), two of them (9.5%) belonged to Haplogroup R1a1-SRY10831.2, and one of them (4.8%) belonged to Haplogroup BT-SRY10831.1(xC-RPS4Y711, DE-YAP, K-M9). According to the abstract for a doctoral dissertation by Vladimir Nikolaevich Kharkov, a sample of 52 Nivkhs (Нивхи) from Sakhalin Oblast (Сахалинская область) contained the following Y-DNA haplogroups: 71% (37/52) C3*-M217(xC3c-M77/M86, C3d-M407), 7.7% (4/52) O3a*-M324(xO3a3c-M134), 7.7% (4/52) Q-M242(xQ1a3-M346), 5.8% (3/52) D-M174, 3.8% (2/52) O-M175(xO2-P31, O3-M122), 1.9% (1/52) O2-P31, and 1.9% (1/52) N1c1-M46/M178. Torroni et al. (1993) reported collecting blood samples from 57 "unrelated and unhybridized [Nivkh] individuals living in Rybnovsk and Nekrasovka villages in northern Sakhalin Island." According to Starikovskaya et al. (2005) and Bermisheva et al. (2005), the members of this sample of Nivkhs belong to haplogroup Y (37/57 = 64.9%), haplogroup D (16/57 = 28.1%), haplogroup G1 (3/57 = 5.3%), and haplogroup M(xC, Z, D, G) (1/57 = 1.8%). In another sample of Nivkhs, possibly "those living on the continent" (although there appears to be an error in the original text), Bermisheva et al. (2005) have found the following mtDNA haplogroups: 67.3% (37/55) haplogroup Y, 25.5% (14/55) haplogroup G, 3.6% (2/55) haplogroup D, 1.8% (1/55) haplogroup M(xC, Z, D, G), and 1.8% (1/55) haplogroup N or R(xA, B, F, Y). According to Duggan et al. (2013), the members of a sample of 38 Nivkhs collected in northern Sakhalin belonged to haplogroup Y1a (25/38 = 65.8%), haplogroup D4m2 (10/38 = 26.3%), and haplogroup G1b (3/38 = 7.9%). One identical Y1a haplotype was shared by eight Nivkh individuals, another Y1a haplotype was shared by six Nivkh individuals, and two other Y1a haplotypes were shared by three Nivkh individuals each, indicating a low genetic diversity of this population. Likewise, one identical D4m2 haplotype was shared by four Nivkh individuals, another D4m2 haplotype was shared by two Nivkh individuals, and a third D4m2 haplotype was shared by two or three Nivkh individuals and a Northeast Yakut individual. The authors also have found Haplogroup Y1a in 13.3% (2/15) of Berezovka Evens, 12.5% (3/24) of Taimyr Evenks, 6.5% (2/31) of Udegeys, 2.6% (1/39) of Kamchatka Evens, and 2.3% (2/88) of Central Yakuts, and they have noted that other studies have reported finding this haplogroup in high frequency in the Ulchi and Negidal, in 9%-10% of Koryaks and eastern Evenks, as well as in low frequency in Central and Vilyuy Yakuts. Besides the Nivkhs, the authors also have found mtDNA that belongs to haplogroup D4m2 in 8.7% (2/23) Sakkyryyr Evens, 3.7% (1/27) Tompo Evens, and 3.1% (1/32) Northeast Yakuts, with the Northeast Yakut individual sharing an identical haplotype with several of the Nivkhs. The authors have noted that mtDNA sequences that belong to the same branch of haplogroup D have been found in Evenks, Evens, Yukaghirs, and South Siberian Buryats and Turkic speakers, and another study has reported one instance of D4m2 in a sample of 154 Dolgans. As for G1b, the other mtDNA haplogroup found among Nivkhs, Duggan et al. (2013) also have found it in their samples of Kamchatka Evens (6/39 = 15.4%), Koryaks (2/15 = 13.3%), Yukaghirs (2/20 = 10.0%), Iengra Evenks (2/21 = 9.5%), and Tompo Evens (1/27 = 3.7%), and they have cited Starikovskaya et al. (2005) as evidence for their statement that haplogroup G1 is also common in the Negidal. The Sakhalin Nivkhs populated the island during the Late Pleistocene period, when the island was connected to the Continent of Asia via the exposed Strait of Tartary. When the ice age receded, the oceans rose and the Nivkh were split into two groups. The earliest mention of the Nivkh in history is believed to be a 12th century Chinese chronicle, referring to a people called Jílièmí (Chinese: 吉列迷), who were in contact with the Mongol rulers of Yuan China. In 1643, Vassili Poyarkov was the first Russian to write of the Nivkh, calling them Gilyak, a Tungus exonym, by which they would be referred until the 1920s. Nivkh lands extended along the northern coast of Manchuria from the Russian fortress at Tugur Bay eastward to the mouth of the Amur River at Nikolayevsk, then south through the Strait of Tartary as far as De Castries Bay. Formerly their territories had extended westwards at least as far as the Uda river and the Shantar Islands until pushed out by the Manchus and, later, the Russians. For many centuries, the Nivkh were tributary to the Manchus. After the Treaty of Nerchinsk in 1689, they functioned as intermediaries between the Russians, Manchu and Japanese, also with the Ainu who were vassals of the Japanese. Early contact with the southern Sakhalin Ainu was generally hostile, although trade between the two was apparent. The Nivkh suffered severely from the Cossack conquest and imposition of the Tsarist Russians; they called the latter kinrsh (devils). The Russian Empire gained complete control over Nivkh lands after the 1858 Treaty of Aigun and the 1860 Convention of Peking. The Russians established a penal colony (katorga) on Sakhalin, which operated from 1857 to 1906. They transported numerous Russian criminal and political exiles there, including Lev Sternberg, an important early ethnographer of the Nivkh. The Nivkh were soon outnumbered; they were sometimes employed as prison guards and to track escaped convicts. The Nivkh suffered epidemics of smallpox, plague, and influenza, brought by the foreign immigrants and spread in the crowded, unsanitary prison environment. Though the Empire of Japan never controlled the northern part of Sakhalin, Japan and Russia jointly ruled the island as part of the 1855 Treaty of Shimoda. From the 1875 Treaty of Saint Petersburg until the 1905 Treaty of Portsmouth, Russia governed all of Sakhalin. From 1905 to 1945, Sakhalin was partitioned between Russia and Japan along the 50th N parallel. Russia allowed Japanese entrepreneur fishermen in Nivkh lands from the 1880s until their 1948 expulsion. The Russian Priamur Governor-Generalship had difficulty finding Russian labour and allowed Japanese and Nivkh fishermen to develop the area, though they were heavily taxed. Russian authorities prevented the Nivkh from fishing in prior coastal and river systems via bans and high taxes from cached fish. The first of many incidents of over-exploitation of fisheries by the Japanese (and later the Russians) on the Tartar Strait and lower Amur occurred in 1898. It drove many Nivkhs into starvation if they could not import expensive Russian foods. Russia underwent the October Revolution forming the Soviet Union in 1922. The new government altered prior Russian Imperial policies towards the Nivkh that were in line with communist ideology. Soviet officials embraced the autonym Nivkh to replace the old term Gilyak, as a hallmark for new native self-determination. A brief autonomous okrug was created for the Nivkh. The government granted them extensive fishing rights, which were not rescinded until the 1960s. But, other Soviet policies proved devastating. The Nivkh were forced into mass agricultural and industrial labour collectives called kolkhoz. Nivkh fishermen were difficult to convert to agricultural practices because of their belief that ploughing the earth was a sin. The Nivkh were soon working and living as a second-class minority group among the massive Russian labour force. These collectives irrevocably altered the lifestyle of the Nivkh. The traditional hunter-gatherer lifestyle disappeared. Soviet authorities showcased the Nivkh as a 'model' nation for a culture quickly transforming from the Neolithic to a socialist industrial model. They banned the use of the Nivkh language from schools and the public square. The Russian language was mandated and russification of the Nivkh accelerated. Many Nivkh stories, beliefs, and clan ties were forgotten by new generations. From 1945 to 1948, many Nivkh, as well as half of the Oroks and all of the Sakhalin Ainu, who had been living under Japanese jurisdiction in the southern half of Sakhalin, were forced to move to Japan along with the ethnic Japanese settlers. Many indigenous people would later return to the area. Chuner Taksami, an anthropologist, is considered the first modern Nivkh literary figure and supporter of Siberian rights. In the post-Soviet Russian commonwealth of nations, the Nivkh have fared better than the Ainu or the Itelmens, but worse than the Chukchi or the Tuvans. The Soviet government in 1962 resettled many of the Nivkh into fewer, denser settlements, such that Sakhalin settlements had been reduced from 82 to 13 by 1986. This relocation was accomplished via the Soviet collectives that the Nivkh had become so dependent on. The closure of state-funded amenities such as a school or electricity generator prompted citizenry to move into government-preferred settlements. With the collapse of the Soviet Union in 1991, the Kolkhoz collectives were abandoned. The Nivkh were dependent on the state-funded collectives, and with their dissolution, rapid economic hardship ensued for the already poor populace. At present, the Nivkh living in the north of Sakhalin see their future threatened by the giant offshore oil extraction projects known as Sakhalin-I and Sakhalin-II, operated by foreign Western firms. Since January 2005, the Nivkh, led by their elected leader Alexey Limanzo, have engaged in non-violent protest actions, demanding an independent ethnological assessment of Shell's and Exxon's plans. Solidarity actions have been staged in Moscow, New York City and later in Berlin. The monthly Nivkh newspaper, Nivkh Dif, established in 1990, is published using the west-Sakhalin dialect and is headquartered in the village of Nekrasovka. The Nivkh were semi-sedentary hunter-gatherers having summer and winter settlements. Nivkh villages consisted of 3 to 4 households shared by several families with larger villages rare, mostly located on the Amur estuary. Households were shared for reasons of community and survival during the harsh cold winters. Villages would last for several decades but were susceptible to floods and sometimes vanished such as the many wiped out during the devastating Amur floods of 1915 and 1968. Often households contained families that were not related. The village was usually composed of people from two to eight different clans, four being standard. In the late fall able-bodied Nivkh men would leave the villages to hunt for game in the surrounding hunting grounds whereas women would gather foods from the forests. Nivkh would move to winter settlements near rivers to survive the harsh snows and catch salmon spawning (see list of Nivkh settlements). The Nivkh were very hospitable, such that the Nanai located upstream on the Amur when faced with hard times would often visit or stay in Nivkh villages. Nivkh clans (khal) were a group of people united by marriage ties, a common derived deity, arranging marriages, and responsible for group dispute resolution. The clan is divided into three exogamous sub-clans. A clan would cooperate with other members on hunts and fishing when away from the village. A Nivkh clan believed they had "one (common) akhmalk or imgi, one fire, one mountain man, one bear, one devil, one tkhusind (ransom, or clan penalty), and one sin." Marriage tended to be exogamic unlike many paleo-Siberian groups. Although within the clan, marriage is endogamic while sub-clans are exogamic. Nivkh marriage customs were very complicated and controlled by the clan. Cross-cousin marriage seems to be the original custom with the clan a latter necessity when the clan was unable to marry individuals without breaking taboo. The Bride price was probably introduced by the Neo-Siberians. The dowry was shared by the clan. The number of men generally exceeded the number of women. It was hard to gain wives, as they were few and expensive. This would lead to the wealthier men having more than one wife and the poor men without. Nivkh's traditional religion was based on animist beliefs, especially via shamanism, before colonial Russians made efforts to convert the population to Eastern Orthodox Christianity. Nivkh animists believe the island of Sakhalin is a giant beast lying on its belly with the trees of the island as its hair. When the beast is upset, it awakens and trembles the earth causing earthquakes. Nivkh have a pantheon of vaguely defined gods (yz, yzng)[clarification needed] that presided over the mountains, rivers, seas and sky. Nivkhs' have extensive folklore, songs, and mythos of how humans and the universe were created, and of how fantastic heroes, spirits and beasts battled with each other in ancient times. Some Nivkhs have converted to Russian Orthodoxy or other religions, though many still practice traditional beliefs. Fire is especially venerated. It is the symbol of the unity of the clan. Fire is considered a deity of their ancestors, protecting them from evil spirits and guarding their clan from harm. An open flame would be "fed" a leaf of tobacco, spices, or a tipple of vodka in order to please the spirits for protection. Nivkhs would also frequently offer items to the deities by 'feeding'. The sea would be "fed" an item of importance in order that the sea god protects the travellers. Shamans' (ch'am) main role was in diagnosing and curing disease for the Nivkh. The rare Shamans typically wore an elaborate coat with a belt often made of metal. Remedies composed of plant and sometimes animal matter were employed to cure sickness. Talismans were used or offered to patients to prevent sickness. Shamans additionally functioned as a conduit to combat and ward off evil spirits that cause death. A shaman's services usually were compensated with goods, quarters and food. Nivkh Shamans also presided over the Bear Festival, a traditional holiday celebrated between January and February depending on the clan. Bears were captured and raised in a corral for several years by local women, treating the bear like a child. The bear was considered a sacred earthly manifestation of Nivkh ancestors and the gods in bear form (see Bear worship). During the Festival, the bear would be dressed in a specially made ceremonial costume. It would be offered a banquet to take back to the realm of gods to show benevolence upon the clans. After the banquet, the bear would be sacrificed and eaten in an elaborate religious ceremony. Often dogs were sacrificed as well. The bear's spirit returned to the gods of the mountain 'happy' and would then reward the Nivkh with bountiful forests. The festival typically would be arranged by relatives to honour the death of a kinsman. Generally, the Bear Festival was an inter-clan ceremony where a clan of wife-takers restored ties with a clan of wife-givers upon the broken link of the kinsman's death. The Bear Festival was suppressed during Soviet occupation through the festival has had a modest revival since the decline of Soviet Union, albeit as a cultural instead of religious ceremony. A very similar ceremony, Iomante, is practiced by the Ainu people of Japan. The Russian Far East has a cold and harsh climate. In the fish-rich Amur River estuary in the districts of Nixhne-Amruskii and Takhtinskii, winters have high winds and heavy snows with mid-winter usually averaging from −28 to −20 °C (−18 to −4 °F). Summers are wet and moderately warm ranging between 16 and 20 °C (61 and 68 °F). The area's biome is characterized as Taiga and evergreen coniferous forests consisting of larch, yew, birch, maple, lilac, honeysuckle, and extensive low-lying swamp grasses. Higher elevations have spruce, fir, ash, lime, walnut and mountain tops have cedar and lichens. Bears, foxes, sables, hares, Siberian tigers, elks, grouse, and deer typical near the Amur outlet which usually floods during the rainy season. Northern Sakhalin is harsher ecologically with mostly Taiga. Winters are longer, with a mean temperature of −19 °C (−2 °F), however, short summers are warmer averaging 15 °C (59 °F) due to warmer Pacific Ocean currents moving around the island. Heavy snows blanket the island of Sakhalin (Yh-mif in Nivkh) during winter, due to monsoon winds blowing from Siberia, drawing humidity as they pass over the Sea of Okhotsk, Sea of Japan, and the Strait of Tartary. Barren tundra dominates the north, with sparse trees such as larch, birch and various grasses, while moving southward, spruce and fir are seen. Bears, foxes, otters, lynx, and reindeer are common wildlife. The Island's major rivers are the Tym' and Poronai, rich in fish especially Salmon. Before Russian colonization, Nivkh villages could be found on these rivers approximately every 5 km. The Strait of Tartary is currently only 20 kilometers (12 mi) wide and is shallow enough that the divide is covered by an ice bridge during the winter that can be traversed by foot or dog-sledge. At the glacial maximum of the Ice Age, sea levels were 100 meters (330 ft) lower than they are today. The Eurasia continent was connected to Sakhalin via the Strait of Tatar and Hokkaidō via the Soya Strait of which humans migrated. This connection explains the similarities of trees, plants, and animals including now extinct mammoths. The receding ice age warmed the area allowing greater tree cover and wildlife, thus new resources for the Nivkhs to exploit. The opening of the Soya and then the shallower Strait of Tartary allowed warm pacific currents to bathe the island and the lower Amur River. Nivkhs lived in two types of self-built winter dwellings. Most ancient of these was the ryv (or to). The dwelling was a round dugout about 7.5 meters (23 feet) in diameter, shored up by wooden poles and covered with packed dirt and grass. The ryv had a fireplace in the centre and a smoke hole for light and smoke escape. The other type of dwelling used for winter is the chad ryv similar to the Nanai dio which was modelled after Manchurian and Chinese dwellings of the Amur. The chad ryv were one-room structures with a gable roof and a kan (Korean furnace) for heating. A nearby shed held sledges, skis, boats, and dogs. Nivkhs traditionally wore robes (skiy for men, hukht for women) having three buttons, fastened on the left side of the body. Winter garments were made of skins from fish, seal, sable, and furs from otter, lynx, fox, and dog. Women's hukht extended below the knee and were light multicoloured with intricate embroideries and various ornaments sewed on the sleeves, collar and hem. Ornaments were coins, bells, or beads made of wood, glass, or metal mostly originating from Manchurian and Chinese traders. Men's skiy were darker coloured, shorter, and had pockets built into the sleeves. Men's clothing were less elaborate with ornaments on the sleeve and left lapel. Men would also wear a loose kilt called a kosk when hunting or travelling on dog-sledge. Boots were made of fish-, seal-, or deerskin, being very watertight. Fur hats (hak) were worn in winter, with the furry tails and ears of the animals used often adorning the back and crown of the hat. Summer hats (hiv hak) were conical made from birch-bark. After Soviet collectivization, Nivkh mostly wear mass-produced Western clothing, but traditional clothing is worn for holidays and cultural events. The Nivkh had a diverse diet being semi-sedentary before colonization. Fish was the main source of food for the Nivkh, including pink, Pacific, and chum salmon as well as trout, Red Eye, burbot and pike found in rivers and streams. Saltwater fishing provided saffron cod, flatfish, and marine goby caught in the littoral coasts of the Strait of Tartary, Sea of Okhotsk, and the Pacific Ocean, though over fishing by Russian and Japanese trawlers have depleted many of these fish stocks. Additionally, industrial pollution such as phenols and heavy metals in the Amur River have devastated fish stocks and damaged the soil of the estuaries. There is a traditional preservation process called yukola [ru], involving slicing the fish in a particular way and drying the strips by hanging them in the frigid air, without salt. The preservation process created a lot of dried fish waste, unpalatable for human consumption but utilized for dog food. Pulverizing dried fish and mixing it with fish skins, water, seal fat, and berries until the mixture had a sour cream consistency is a favorite Nivkh dish called mos. Nivkhs would hunt seal (Larha, Reinged, Reibbon, Sea-lions), duck, sable, and otters. They would gather various berries, wild leeks, lilybulbs, and nuts. Contacts with the Chinese, Manchu, and Japanese from the 12th century on introduced new foods incorporated in the Nivkhs diet such as salt, sugar, rice, millet, legumes and tea. Russian 19th-century colonisation introduced flour, bread, potatoes, vodka, tobacco, butter, canned vegetables and fruits, and other meats. ^ Zgusta, Richard (2015). The peoples of northeast Asia through time: Precolonial ethnic and cultural processes along the coast between Hokkaido and the Bering Strait. Brill. p. 71. ISBN 9789004300439. ^ Jeffrey T. Lell, Rem I. Sukernik, Yelena B. Starikovskaya, Bing Su, Li Jin, Theodore G. Schurr, Peter A. Underhill, and Douglas C. Wallace, "The Dual Origin and Siberian Affinities of Native American Y Chromosomes." American Journal of Human Genetics 70:192–206, 2002. ^ Antonio Torroni, Rem I. Sukernik, Theodore G. Schurr, Yelena B. Starikovskaya, Margaret F. Cabell, Michael H. Crawford, Anthony G. Comuzzie, and Douglas C. Wallace, "MtDNA Variation of Aboriginal Siberians Reveals Distinct Genetic Affinities with Native Americans." American Journal of Human Genetics 53:591-608, 1993. ^ a b M. A. Bermisheva, I. A. Kutuev, V. A. Spitsyn, R. Villems, A. Z. Batyrova, T. Yu. Korshunova, and E. K. Khusnutdinova, "Analysis of Mitochondrial DNA Variation in the Population of Oroks." Russian Journal of Genetics, Vol. 41, No. 1, 2005, pp. 66–71. Translated from Genetika, Vol. 41, No. 1, 2005, pp. 78–84. ^ "The Indigenous Peoples". Museum.sakh.com. The Sakhalin Regional Museum. Archived from the original on 2006-01-01. Retrieved 2006-01-01. Smolyak, A. V. (2001) Traditional Principles of Natural Resources Use among Indigenous Peoples of the Lower Amur River. Journal of Legal Pluralism, Num. 46. ISSN 0732-9113. Wikimedia Commons has media related to Nivkhs.